With 12 great songs and a story that's very appealing to kids, A City Spectacular has always been a favourite with audiences. The show consists of 10 lead characters but also has a number of great cameo roles. The show takes place in three settings: an old building site, the town square and an office. A backdrop of the building site can remain in place throughout the show with alternating flat sets placed in front of it or for an easier alternatively, key items can be placed on stage by actors or crew to establish the settings. Simple contemporary clothing is all that is needed for the majority of the costumes and only the mayor, city officials and the rap performers require any kind of special costumes. A City Spectacular provides an opportunity to study local government and its place in providing facilities and services for the local community including services and facilities for youths. The show looks at ways in which people could go about improving their local environment and issues such as graffiti, litter and pollution are discussed. The show also examines the children's attitudes towards each other and their place in the community which changes and evolves as they become more involved in their own positive project, the 'City Spectacular'. It's the holidays and the local kids are bored and disgruntled. There's nothing to do so they spend much of their time hanging around an old building site they've made into their hang-out. The local tough guy, Sonny, announces he's taking over. A showdown is planned, but in the meantime, some of the kids hear about the mayor's City Spectacular competition. A prize is offered to the community group that can come up with the best way to improve the city. Sonny and the local kids become unlikely allies when they decide to enter the mayor's City Spectacular. They overcome the efforts of the disapproving town hall officials to exclude them from the competition and work together to create a marvellous message to the mayor in the form of a rap. 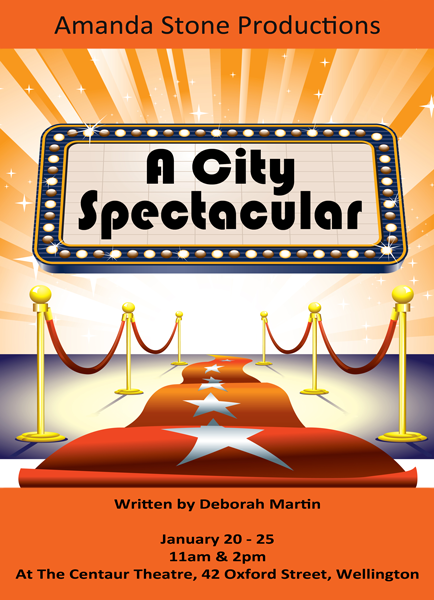 A City Spectacular is a great play about kids developing a new, positive attitude. The show can be performed with a smaller cast consisting of around 25 - 30 children. There are 18 main roles that can be filled with the best actors while the rest of the cast can play supporting roles like building site kids or the townspeople. With a larger cast of 70 - 80, different children can be used in the choruses for scenes 1, 3, 5 and 7. The 18 main roles belong to a number of different groups. Firstly there are 6 main kids who lead many of the songs and dances and these roles are best suited to confident and enthusiastic actors. Then there is Sonny and his gang of 4. Sonny should be played by an actor with a good sense of humour and his gang should be played by strong singers and dancers who are able to work well together. The role of the mayor needs to go to a strong singer as there is a solo involved. There are 6 officials that move around together and often speak fast dialogue one after another so quick witted actors will be needed for these roles. There is also the small role of an announcer who delivers a speech to the mayor before the rap. Lastly there are two groups of extras, street kids and the city crowd, which can vary in size depending on the number of actors available and are involved in a number of different scenes. Please feel free to download a sample of the script as either a Microsoft Word of PDF document. Here you're able to listen to a small sample of vocal backed music tracks featured in the show. All prices are in New Zealand dollars. Site by Jack Stone.